In this tutorial we will show you how to install OwnCloud on your Debian 9. For those of you who didn’t know, OwnCloud is a free and open-source software which enables you to create a private “file-hosting” cloud. OwnCloud is similar to DropBox service with the diference of being free to download and install on your private server. 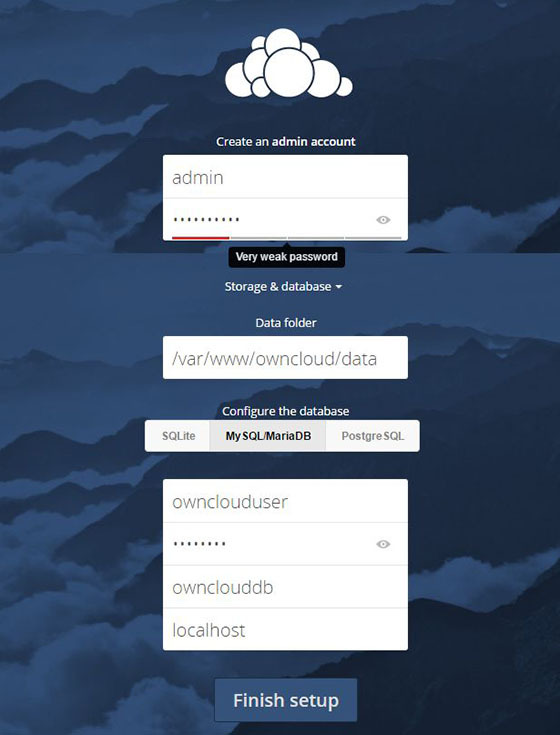 Owncloud made by PHP and backend database MySQL (MariaDB), SQLLite or PostgreSQL. OwnCloud also enables you to easily view and sync address book, calendar events, tasks and bookmarks. You can access it via the good looking and easy to use web interface or install OwnCloud client on your Desktop or Laptop machine (supports Linux, Windows and MacOS). This article assumes you have at least basic knowledge of Linux, know how to use the shell, and most importantly, you host your site on your own VPS. The installation is quite simple and assumes you are running in the root account, if not you may need to add ‘sudo’ to the commands to get root privileges. I will show you through the step by step installation OwnCloud on a Debian 9 (Stretch) server. Step 3. Installing OwnCloud 10. Step 4. Configuring MariaDB for OwnCloud. Step 5. Configure Apache Web Server for OwnCloud. To configure ownCloud, we will use the web interface. So, go ahead and open up a web browser and point it to http://server_ip_address/owncloud You should see a web page like this. Enter username and password for the administrator user account, click on the ‘Advanced options’ hyperlink and enter the data directory (or leave the default setting), then enter database username, database password, database name, host (localhost) and click ‘Finish setup’. Congratulation’s! You have successfully installed OwnCloud. Thanks for using this tutorial for installing OwnCloud on Debian 9 Stretch system. For additional help or useful information, we recommend you to check the official OwnCloud web site. Related Posts of "How To Install OwnCloud on Debian 9"